$2,000 Look at those Bloodlines! 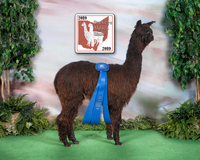 He's a strong young boy with beautiful fiber and genetics. Unfortunately for us, he is closely related to most of our girls. His mother is a staple of our herd and has produced many champions, including PIVAL Blazen Son; the most decorated white male out there (that was not kept indoors). 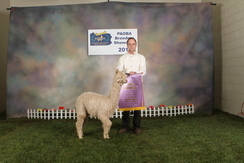 His father, Young Valient, is known for his fiber and has won the "Spirit of the Industry" award. If you're looking for great fiber and genetics, this is your boy! 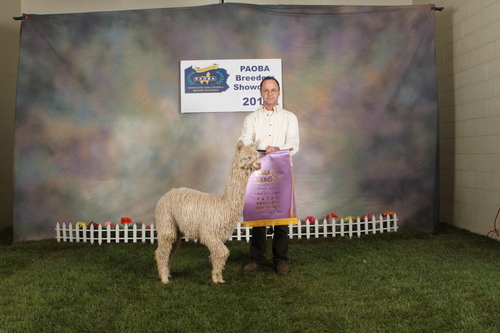 His dam, Clara, came over in the last import with a 14.5 micron fiber and produced nothing but beautiful animals. She carried her fine lustrous fleece up to her passing in 2015 (MFD: 22.4 SD: 4.5 COV: 20.3% FG30: 5.2%).